See what I'm talking about after the jump! As I mentioned, I don't usually buy Legion scale figures. I find that they don't fit into scale with any other figures I buy and they're just too simple. I like my TF's to have a little substance... and while the engineering of these has jumped up in the last few years, I still just don't care for them. But Joe, why did you go and buy Twinstrike if you don't care for these? I'll tell you... soon. First, let's check Twinstrike out. Twinstrike comes packed in the new standard of card for the TF:Prime Beast Hunters line, a primarily white card with the TF:PRime logo and sub-line Beast Hunters logo on the front with character art for Predaking adorning the corner. The card insert gives us a note about Twinstrike's accessory, a piston hammer, being included as well as having a 'File Card' attached. The back of the card gives us a nice shot of Twin Strike in both Bot and Alt... or perhaps Beast-mode... or 'Dragon-Mode' as the card states. 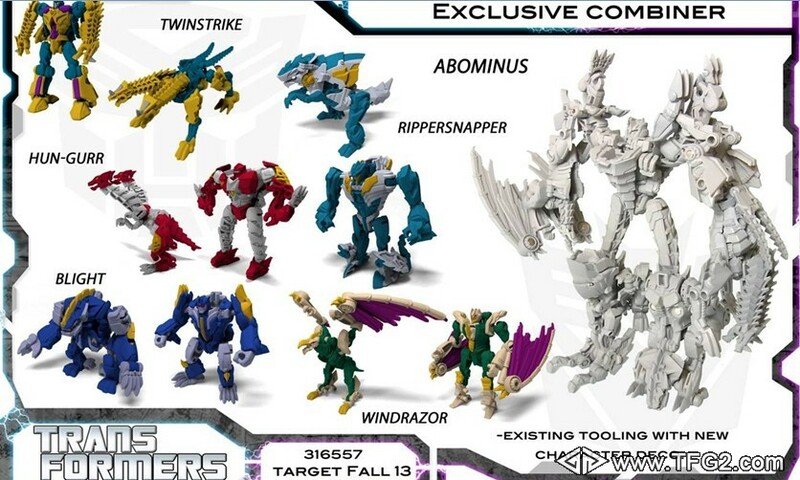 What do you think the new Mode nomenclature should be for these new Predacons? I think Beast-mode is most appropriate. The back also gives us a one-line Bio that is incredibly vague. Open up the packaging and we find Twinstrike tied into his tray along with his 'piston hammer' and folded instructions. Twinstrike is a fairly simple little guy. His articulation is fairly limited... having ball joints at the hips, shoulders, and ankles along with a couple of hinges that are more for transformation versus articulation. Twinstrike comes with his one accessory, his piston-hammer. The hammer can be used with Twinstrike in either mode and has more than one post that can be used, one on the handle, the back of the head, and the side of the head. As you can see... not much articulation. Action poses are incredibly limited. Getting Twinstrike into Beast-mode is fairly simple. Star by flipping open his chest and folding his Bot head in and then closing the chest. Swing his arms forward and then in over the shoulders. This will allow you to swing the smaller legs towards the front. The lower calves pull away outward from the legs and can then be swung up to cover the thighs. Be sure to push them back in. The feet swivel at the ankles so Twinstrike's heels become the clawed feet of his Beast-mode. Fold the twin tails out to the back and swing the heads up to face front. Not a bad looking Beast-mode. It'd be great to get Twinstrike in Deluxe scale... but it doesn't look like that's going to happen. Using any of the 3 posts, Twinstrike's piston-hammer can be mounted on his back or hip. I went with the back. If Twinstrike looks familiar to you, you're not imagining things. Twinstrike is an updated version of the G1 Terrorcon, Sinnertwin. Like most remakes or homages to G1 characters, Sinnertwin was renamed... though I think it was more to his name versus copyright issues. I doubt Hasbro wanted to have a character with 'sinner' in their name on the shelf. 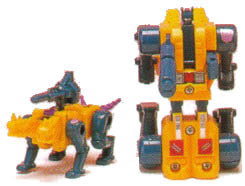 The original Sinnertwin was part of the Decepticon special team, the Terrorcons. Named so as they were monsters and creatures of nightmare that were feared by Bots on both sides for their chaotic behavior, lashing out and destroying anything due to orders or boredom. The other thing the Terrorcons were known for was that they were a Combiner team, and in their case, they combined into the feared Abominus. And that leads into why I bought a Legion scale figure. Hasbro, via ToyFair, revealed that they will be releasing a Target exclusive, Legion scale set of Beast Hunter Predacons that COMBINE into Abominus! I may not be one for the Legion scale, but ABOMINUS! I have to have him! 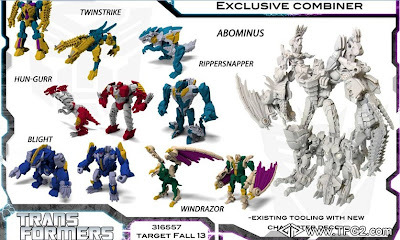 Hun-Gurr, Rippersnapper... who retained their G1 names... Blight (Blot), Twinstrike (Sinnertwin), and Windrazor (Cutthroat) will all combine into a Legion scale Abominus that should be as big if not bigger that the average Deluxe scale figure. He'll certainly look good on my combiner shelf. So far, only Twinstrike has been made available, but keep your eye out for the rest of the Terrorcons to be appearing in future waves. The Terrorcons were a fun sub-group and of course, COMBINER. So, make sure to start getting yours now! Pics, words, and terrorizing by Scion of Primus. i was just about to buy this guy yesterday at my local target. walking towards the cash registers, i decided against it and set him down in the greeting cards and went home empty handed. maybe its a good thing? I'll be waiting for the Target gift set if I buy at all. Isn't Target releasing an exclusive giftset of all the Cybertron Terrorcons soon? He's really amazing! I'm really looking forward to Abominus!